Regardless of whom you are going to vote for Ohio Governor or House of Representatives, please vote NO on Issue 1. It attempts to embed in the Ohio Constitution what would normally be in the criminal code. For most people that may not seem to be a big deal. But if passed, it fundamentally changes how we deal with criminal behavior in a way that is inflexible and without due consideration of the changing circumstances or conditions that judges, prosecutors and legislators have to consider in order to see that fairness is attained and the public is protected. 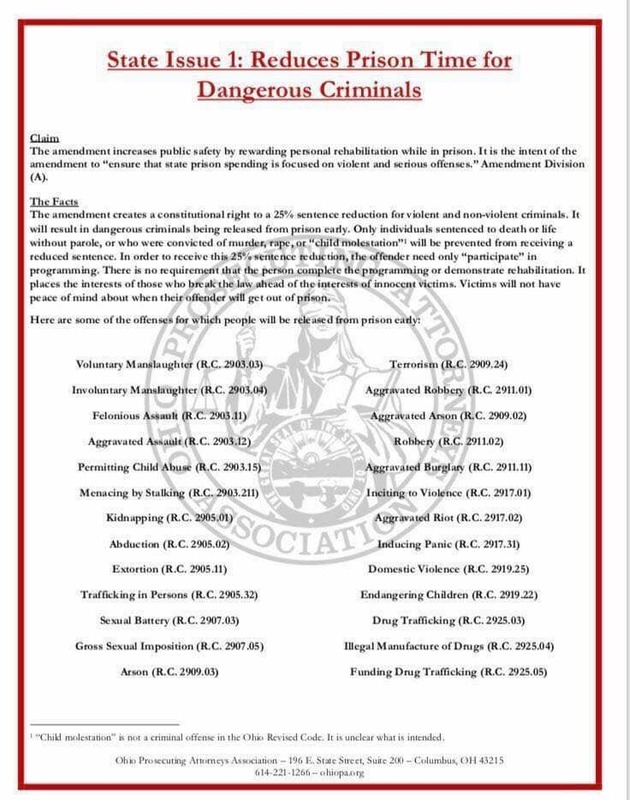 Passage of Issue 1 ties the hands of the General Assembly to make even the simplest corrections or adjustments in these specific criminal statutes as needed. Once passed, even minor changes to this new section 12 to Article XV of the Ohio Constitution can only occur after a majority vote of the people following either a successful petition drive or 3/5 vote of both Ohio House and Senate. I am an advocate for criminal sentencing reform. I believe some of our criminal penalties disproportionately affect people struggling with addiction. However, passage of Issue 1 will likely discourage rehabilitation and undermine the good work already being accomplished within our drug courts. No treatment plan is provided or required. The amendment would allow drug users to remain on the street with no action plan and removes the judicial option to offer treatment in lieu of prison. It creates mandatory options for sentence reduction across the board – not just for non-violent offenders. Parolees who show a lack of respect for judge’s orders – indicating possibility of further criminal action – can only be sent to prison after committing criminal violations. Please consider these legitimate concerns and vote NO on Issue 1. Thank you.